Under the Qin Dynasty, the first Emperor of Ancient China, Qin Shi Huang, famous for unifying China and his army of Terracotta Warriors, reigned. Though he exhibited strategic genius, he was unmistakably paranoid of Confucian Scholars; who he believed plotted behind his back. He was said to have feared the ink-brush as much as the sword and had a deep-rooted fear of intellectuals. As a result, in 213 BC, he ordered any written works he viewed as ‘oppositional’ to be burned. He also allegedly had 460 Confucian scholars buried alive in 210 BC. It is where we get the term ‘burning of books and burying of scholars‘. 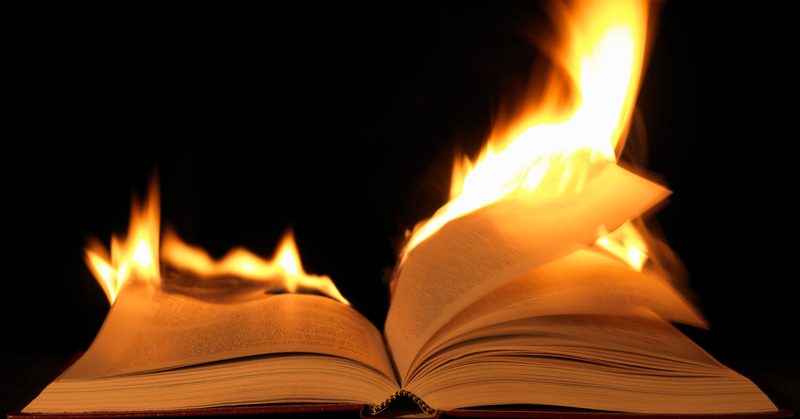 The earliest known ‘book burning’ was the ‘destruction of Ebla‘ in 2240 BC, and since has been marked by an element of censorship usually perpetrated by political, religious or cultural leaders. In crude terms it’s the ‘scouring of knowledge by tyrannical oppression’. After the First Council of Nicaea, which was an assembly of Christian Bishops in 345AD to organize and establish doctrine, Roman Emperor Constantine issued an edict against nontrinitarian Arians, which included systematic book burning. So the mentality was to destroy all evidence of history that was oppositional or dubbed as evil. In the vast chronology of book burning, this seems to be the mentally shared among anti-freedom of expression advocates. This vile, despicable act of destroying knowledge, attempting to erase history and suppressing freedom of thought and the exchange of ideas is the antithesis of a free nation. We’re reminded by history of the sacredness of knowledge by how many times it was either erased or attempted to be eradicated from human memory. We must, as a Nation of free peoples, never embrace the mentality that would make permissible the obliteration of history, knowledge or the freedom of expression, for whatever reason we may find it justifiable to do so. Our freedom of expression is paramount to our progress as a civilization and to our evolution as a species. You may find certain artifacts, relics, symbols, ideas or thoughts to be offensive and antiquated, just as Constantine thought Arius’s teachings to be wicked, but we must never allow our emotions, or our personal ideologies, to ignite the flames that wind up burning books. In short, I may not like what you have to say, think or feel, but I certainly and fully support your right to have freedom of expression.